Following Gillard’s guillotining we’re wondering what Kevin Rudd’s mass appeal is all about. Psychoanalysis of the Australian body (brain?) politic is called for. At the risk of serial re-blogging, Michael Duffy’s analysis in SMH in February last year during Kevin’s failed coup may help. An edited extract follows. “Some say the people like Rudd because they’ve never met him. This is true enough, but it fails to tell us why they like the unmet Rudd, the one they’re familiar with from TV. 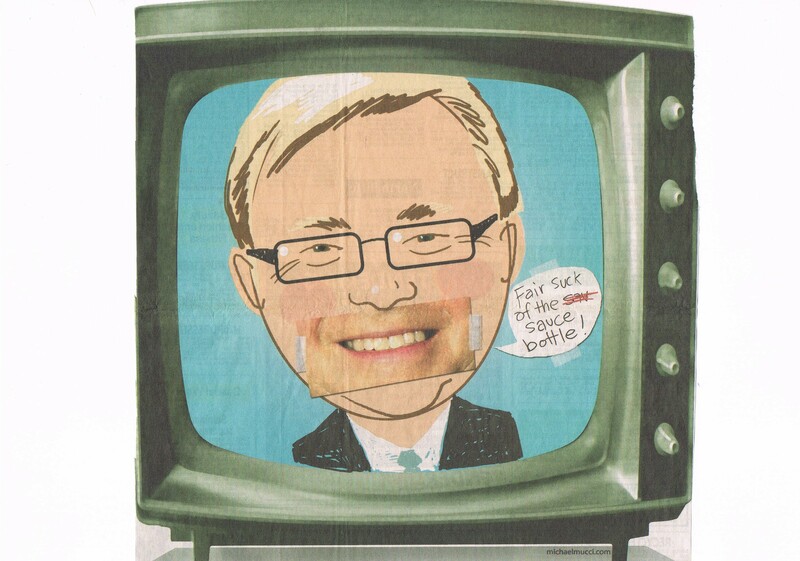 TV Rudd is a pretty unusual creature when compared with most other politicians we see on the screen. Strange as it seems, it is this difference that many people are attracted by. He reminds them of people – or characters – they see often on the telly, and they like that. Such creations are far more warm and interesting, after all, than real politicians. In the context of television, Rudd’s artificiality has been his greatest asset. Rudd’s face is a smooth circle with relatively small features. It’s almost child-like and can remind you of TV cartoon characters, whose faces are often based on children’s. The exception is the mouth. All politicians have to smile a lot when they don’t want to, but few have been less successful in pretending to be sincere than Rudd, whose ghastly smile can look so false it seems to come from another face, creating the effect of something constructed using an old police identikit. Then there’s his voice. I can’t recall a prime minister less capable of speaking simple English than Rudd. His attempts at the vernacular – the Vegemite and the sauce bottle – are gruesome. Often his sentences sound like they’re constructed in another language and turned into English by a cheap translation app. In terms of political character, he represents conveniently little. Changing his mind on climate change symbolised this. He seems to stand for nothing except the sound of his own voice. The general impression this creates is of a virtual personality, and possibly Rudd knows this. His spooky references to himself in the third person suggest an awareness of himself as a construct, a work in progress. When Rudd’s smooth face is immobile, he looks like a cartoon character. When his relentless perkiness and utter certainty are to the fore, he’s like a program presenter. And when his use of language collapses and his depthless self-pity and ambition are given a run, he resembles a participant in a reality program. Rudd is a creation of television. Sunrise in 2001 turned a politician without any base and few friends in the ALP into a celebrity. Ever since, he has been as dependent on his ratings as any other TV star. He is the ultimate product of the digital age and 24 – make that four – hour news cycle. All form and no content”. Apparently during the execution last Wednesday social media went berserk with a record 500,000 tweets. Over half were re-tweets, so my recycling of Duffy is the norm. Anyway gotta zip, as Kevin would say. Hope my programmatic specificity works for you.